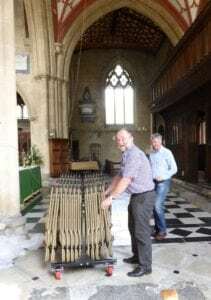 On Thursday 27 July, a merry band of workers assembled to take delivery of new folding chairs, which will provide additional seating at busy services. The cost was shared equally by Edington Music Festival Association and the Friends, following a generous bequest to both. We think you’ll find them a good deal more comfortable than the old wooden chairs! 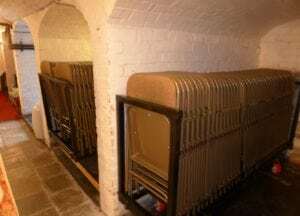 The new chairs look very much at home in their purpose-built storage racks in the crypt. Roger Pinson and Nicholas Buckman manoeuvre a rack of chairs under the tower crossing. 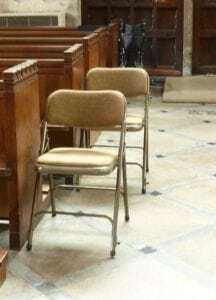 The new chairs will offer greater comfort and safety than the old wooden folding ones that they replace. We look forward to their first outing at the Music Festival in August.